Looking back from where I started with my internship search to actually being in the process of one, there are many things to take into account both from the past as well as looking towards the future. For summer-bound interns I would firstly say “START NOW!” So many opportunities are present from the get-go that procrastinating will only further inhibit you from finding an internship to your liking. Even starting halfway through one semester may force you to not get an internship until two semesters later. Get the ball rolling now because ultimately it’s about you and your future. While I initially viewed not coming to the OEL with an internship in mind as a being behind the curve, I learned so many positives from that small experience. Imagining the search as if it was an actual job process, I found the experience rewarding because it helped me hone in on an exact interest rather than speculating on where I wanted by career track to go. Asking fundamental questions now has really helped me be precise in exactly what I want from a job as well as understanding the task and skill-sets needed to get the job accomplished. This understanding of my desires and wants helped me better hone my resume. By knowing what I wanted I was able to manipulate and highlight what I’ve done to show my prospective employers what I can do and further build upon. Knowing that my current internship is very heavy in database management, I styled my resume to show how every past job held knowledge-based management in high regard and how I was able to read, decipher, and analyze data presented to me. Ultimately, this internship will be a vessel to guide my basic understanding of the work environment to a true mastery. The importance of one’s knowledge of Microsoft Office and other computer tools, the investment in the music product world from being a professional player, and advanced macro business techniques I’ve learned from Berklee are about to come together over the next few months to create a fully developed and effective toolbox that can make a difference in the workplace now and in the future. My greatest expectation from my internship at GTRStore is to see how heavy the day-to-day shuffle of the workforce is and how one must constantly be learning and analyzing their macro environment to create a better running machine- to generate income and success for a groundbreaking company in a market that is definitely shifting with many other 21st century business models. 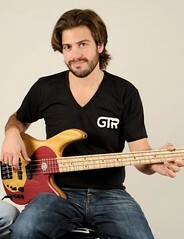 Joe Sirna, an Music Business major at Berklee College of Music, is currently interning at GTRStore in Edison, NJ. As a bassist/guitarist this opportunity allowed him to work behind the scenes in conjunction with many of the companies he’s valued such as D’Angelico, Fender, and Fodera. Over the next few months Joe will aide in the creation on an online database built by musicians for musicians to enhance the e-commerce experience as well as assisting in the design of custom instruments proprietary to GTRStore.